A holoku is a Hawaiian dress with a train. This might turn into more than one story, as mine usually do! We were part of an Hawiian promotion at Brentwood Mall, in Vancouver (Burnaby) B.C. They had an enclosed space, filled with water. They decided to build an island in this water, and my husband played the part of Macahuku, the shipwrecked artist, and he did pastel portraits of people on this island. His clothes were battered to make him more “authentic.” I was dressed in Hawaiian Mumu’s and I scheduled the appointments from the perimeter of the Island! Get the picture? 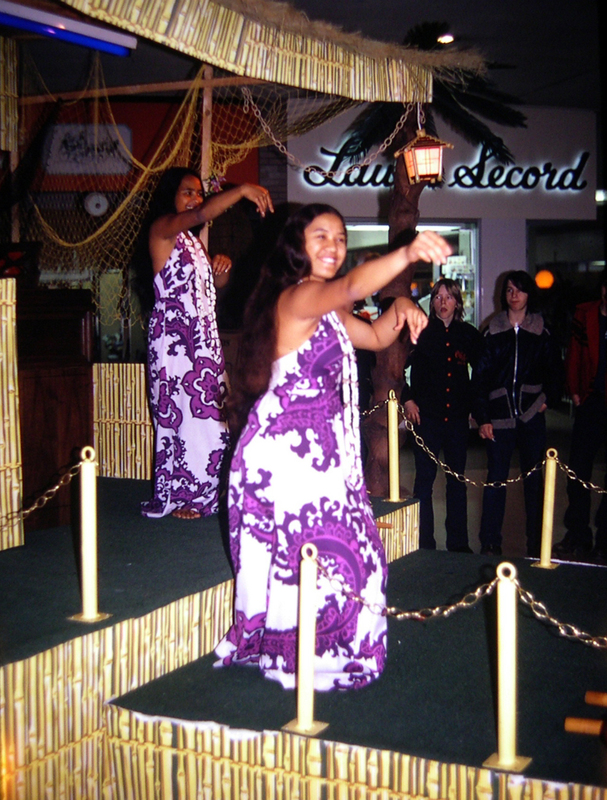 Brentwood Mall brought entertainers from Hawaii, from the Maui Lu, which, at the time, was owned by Gordon Gibson who lived in West Vancouver. 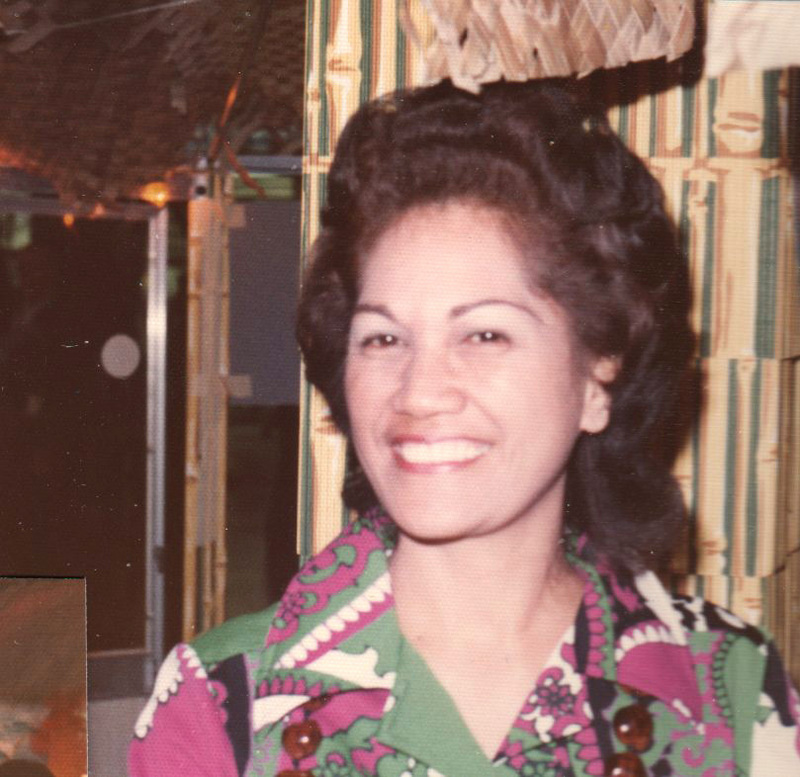 Jessie Nakoako who played and sang, Loretta Chin, chaperone, but also a Hula dancer, and three teenagers, Moanalani, Alohalani, and her sister, Kaui, whos full name was Kauimiolikunaokala Kamkaokilani. When they weren’t performing, the girls. joined us down on our Island. We formed quite a friendship. 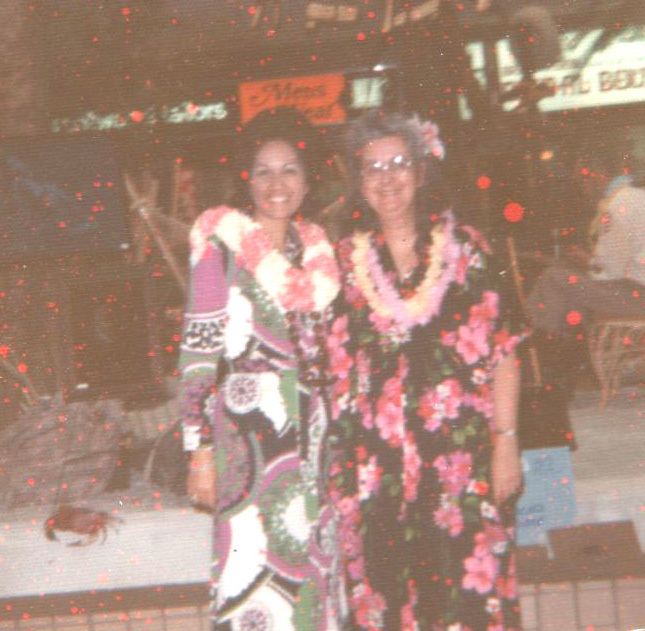 Here’s where my story takes a turn (for the better, I hope), The last night of the promotion, the Brentwood management threw a Luau in the public area of the mall for the staff of all the stores. The Hawaiian group wanted us to go, but we said we weren’t staff, so we were not allowed to go. They went and talked to the manager. “If the McGuires don’t go, we no go.” We were given tickets. When we arrived, the girls were waiting to greet us, and said to come and sit with them at the head table. We said we couldn’t do that… and went to one of the other tables that were set up. The girls sat with us. Manager said they had to go and sit at the head table. “ If McGuires can’t sit at head table, we no sit at head table.” Guess where we sat! Kaui and Moana were both graduating from high school that year, and invited us to go to Hawaii to be at their ceremonies. Loretta had a suite in their home and invited us to stay with them in Kahalui. I still remember the address… 154 Molakai Akau. We went for two weeks, but along the way, it got extended for another week, when we were to stay in Honolulu with Loretta’s Mom, so we could attend a Ball. The Holuku Ball! 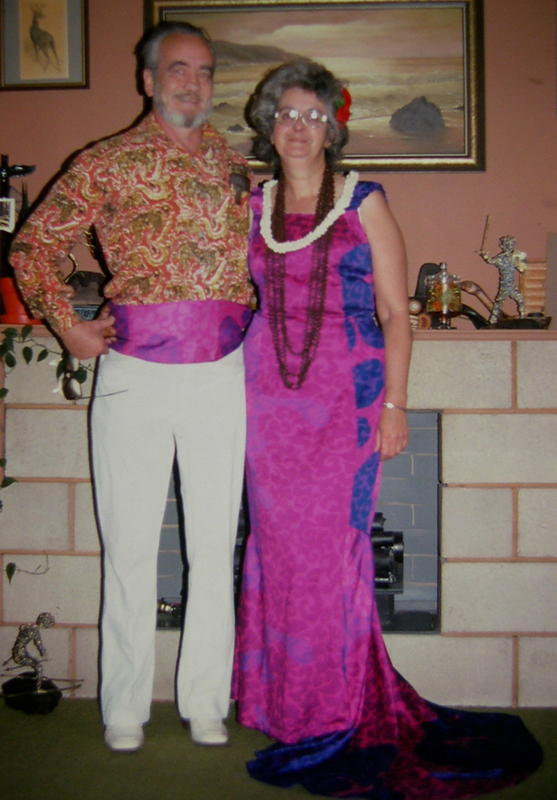 There would be a prize for the best dressed Hawaiian couple, and another one for the best dressed Houli couple. I bet you thought I forgot about the Holoku! Dress… Oh Oh! Had to be a holoku.. a dress with a train… and my husband was to wear white pants and a sash made of the same dress material. My husband felt the beginning of a kidney stone attack coming on, so we changed our reservations again and flew home. Never got to the Holuku ball! So, what do you do with a holoku in Vancouver? 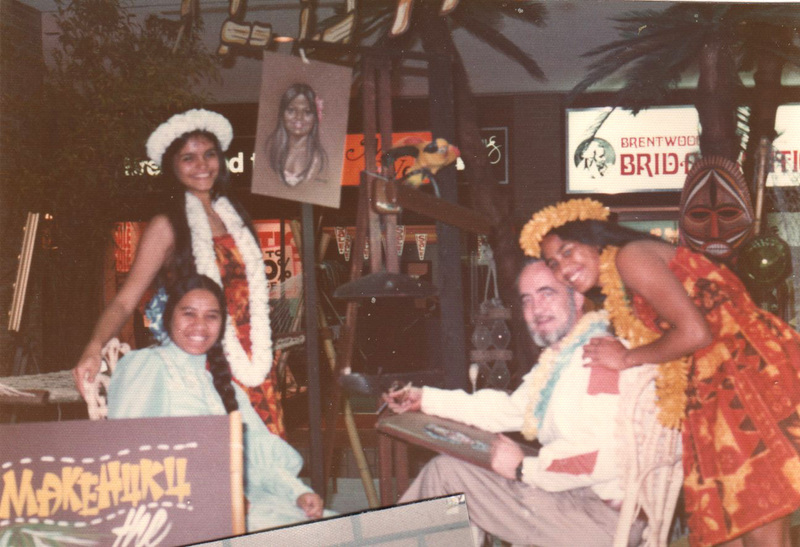 We had a small gallery at Scotsdale Mall, and when they had their Hawaiian promotion, I wore it, and we won the prize for best dressed participants in the mall! In a very round about way, I did get us back to the holoku! ← A Five Pound Trout! Hehehe! What a great story! Too bad about the kidney stone attack, though! You look fabulous! I love how insistent the Hawai’ians were. We are just stubborn people, I guess! Good morning, Jolene. Thanks for coming by, and for the comment. You flatter me! And I love it! Let’s have a cup of tea, and get to know each other! Norma another wonderful story! It goes to show you how friendly and outgoing you are towards these people. And it seems everyone you meet you have open arms for.Too bad you had to leave your Hawaiian trip early due to kidney stone attack but the dress was worn at a later date and even won a prize!Thanks for the tea & cookies.Keep shining! Good morning, Dianne! Great that you come for tea, and sometimes you get cookies. The kidney stone attack was something that he didn’t want to have while we were away from home. Too expensive. It might have been alright to stay, but we thought we better not take a chance. Mickey went to Tahiti, heading for the Cook Islands and he did get an attack. Had a terrible time getting home… and passed the stone on the bus from Seattle to Vancouver! No refund of hotels or air fare that he had paid and couldn’t use. I do appreciate your visits, Dianne! Good morning, Carol! Always glad to see that you are visiting. Pour a cup of tea, and chat for a while. It’s funny how I can remember some things, and yet, when talking to someone will realize that I had forgotten what they are mentioning. The dates of some birthdays remain with me, and yet there are others that I should know, and don’t. there os an awful lot of” Stuff” packed away in my head, and sometimes it takes a few minutes for it to get sorted through to find the right answer! Hi Heather! You’re back! I missed your visits while you were off enjoying a holiday. Pour the tea so we can “chew the fat”. You have spent quite a bit of time on my Flickr site this morning!! Thanks for your comment. I often wonder if my stories make any sense as I go from one thing on to the next as the memories flood back into my mind.